Pooja room is important space in your home where you decorate the idol of god and worship to bring health, wealth and prosperity. It is believed that if your pooja room situated in right place of your home, then it brings positivity, and energy. 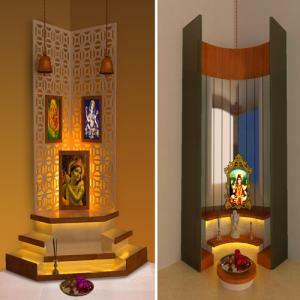 East and North East is the best direction to make pooja room and if you are having multi storyed house then place your pooja room in the ground floor. Always keep in mind don't attach the toilet and kitchen near the pooja room and if you have no more space then you can make pooja room in your bedroom. Make sure you do not point your legs towards the temple. When you are placing the god on pooja room then keep distance between them. Keep clean and peace in pooja room. Use white color marble in pooja room don't use black and green marble in pooja room. According to vastu, always place earthen lamp in front of the god.